Good nutrition during the developing years of life has been correlated with improved growth, body height, IQ, educational achievement and hourly wage. Are you familiar with the current guidelines for infants, adolescents and teens? Age 0-4 months. Breast feeding only, either directly from breast or expressed via pump. Supplement with Vitamin D 400 IU/Day (800 in winter). If mother cannot breast feed, iron-fortified infant formula is recommended. Do not offer juices, water, nonhuman milk or foods. If family history of allergy or atopic dermatitis, using breast milk or hypoallergenic hydrolyzed (casein or 100% whey protein) infant formulas instead of cow’s milk formulas may reduce the risk in the child. If infant was preterm or small for gestational age (SGA), nutrient-enriched and soy formulas are not recommended. Many formulas boast the addition of probiotics and long chain polyunsaturated fatty acids (LCPUFA) to their products, but there is no evidence that these are beneficial to the infant. Age 4-6 months. Begin to introduce single grain, iron-fortified cereal (1 tbsp cereal mixed with 4tbsp breast milk, gradually increase the amount of cereal over time). Never put cereal in a bottle! Sit child upright and feed to them with a spoon. Age 6-8 months. 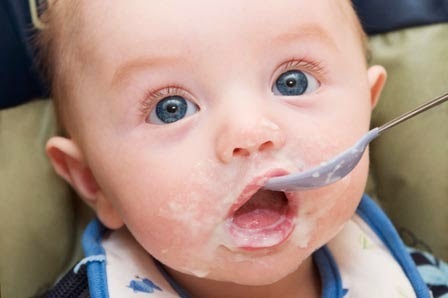 Once all cereals have been tried, continue breast milk while gradually adding solids. Begin introducing 1-2 tbsp of both fruits and vegetables, strained, twice daily and increase to 2-3 tbsp. Try baby fruit juice in a cup and offer finely chopped or mashed fruits and cooked vegetables once all strained varieties have been tried. Introduce 1 food each week to determine which foods are poorly tolerated. Start with single ingredient baby foods before introducing mixed ones. Limit 1 serving per day of carrots, beets and spinach (may cause methemoglobinemia) and never feed them honey. Age 8-12 months. Introduce finger foods in cups and encourage self-feeding (allow baby to get messy). Begin to add finely chopped meats, one per week. Avoid sweetened beverages and foods that may get stuck in the throat (nuts, raw carrots, round candies, hot dogs, apple pieces, grapes and chips). Introduce no more than 4 ounces of unsweetened 100% fruit juice a day. Be sure to sit child up straight in high chair while eating, and always taste heated foods before serving. Do not restrict fat intake unless directed to do so by pediatrician. Age 12-24 months. Add whole milk and eggs. Offer small portions. Never force toddler to eat. Continue to offer foods that have been rejected! Bedtime bottles are recommended. Transition to reduced fat (2% or fat-free) unflavored cow’s milk. Continue unsweetened 100% fruit juice and water. Limit sodium, sugar-sweetened beverages, saturated and trans fat intake. Encourage fruits, vegetables and whole grains and always offer water. Age 2-21 years. Primary beverage should be fat-free unflavored milk. Encourage healthy eating habits starting at age 11, stressing daily breakfast, limited fast food and eating meals as a family. Continue to limit sodium, sugar-sweetened beverages, saturated and trans fat intake. Encourage fruits, vegetables and whole grains. It is important not to overfeed your child. This has been associated with higher fat mass in children, insulin sensitivity (risk of diabetes) and childhood obesity. 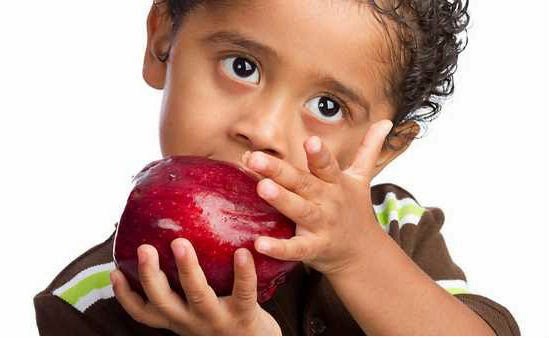 Nutrition (pediatric and preventive care). In DynaMed [database online]. EBSCO Information Services. http://web.a.ebscohost.com.ezproxy.hsc.usf.edu/dynamed/detail?vid=3&sid=7ebdc599-239e-4629-b0ad-740dd1944370%40sessionmgr4005&hid=4107&bdata=JnNpdGU9ZHluYW1lZC1saXZlJnNjb3BlPXNpdGU%3d#db=dme&AN=115435. Updated May 02, 2014. Accessed May 6, 2014.